The Tour de France started off as a crazy idea, and got steadily more outlandish during its first 12 years. The 1903 event saw 60 riders travelling 2,500 kilometres during 19 days on the basic cycle machinery of the day. There were only six stages and no convenient breaks for sleep. Competitors were expected to ride through the night. The first winner was well-known French rider Maurice Garin, nicknamed the "Chimney Sweep". The idea of the Tour was to sell copies of L'Auto newspaper, a publicity stunt that was such a success it destroyed the paper's rival Le Velo in the process. Yet the 1904 Tour nearly put paid to the whole idea, such was the skullduggery, poor behaviour and outright cheating that went on. Fans left nails in the road in front of their favourites' rivals while competitors themselves riders took car trips and even train rides. L'Auto proclaimed the death of its own idea, but then changed its mind and enforced stricter rules instead. This early crisis, like others would be later, was overcome and in 1905 harsh mountain roads were added to the race. The Ballon d'Alsace is not the worst obstacle these days but was the first big climb on any Tour. Rene Pottier was the first rider to the top, yet appeared to gain no satisfaction from this or his 1906 Tour win. He hanged himself from the hook used to store his bike before the 1907 race. A failed romance was the official explanation but perhaps he did not relish the race's length. By now this had stretched to 4,500km - almost twice the first event - but average speeds continued to rise. The first double-winner was Lucien Petit-Breton in 1907 and 1908. And 1909 saw the first really awful weather, with snow in July on the higher ground. But the Tour's next big change was in 1910, and the introduction of the real high mountains of the Pyrenees and then the Alps a year later. 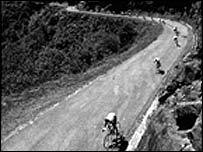 The Tour's founder Henri Desgrange was a hard man, yet even he was sceptical when the idea of crossing these giant lumps of rock was suggested. A colleague at L'Auto was sent to reconnaissance a typical Pyrenean climb. Despite himself having to be rescued after foul weather descended, he reported back that it would be passable come the summer. 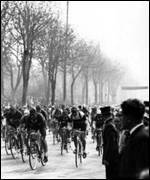 Many riders were not convinced and the first stage resulted in one accusing Desgrange of being an "assassin". The race founder was unmoved, particularly when the complaining rider Octave Lapize, won the Tour itself. The basic format of the race, including these giant mountains had been created and there were four more editions before World War I. In 1911 there were allegations of rival teams poisoning riders, while in 1913 a famous incident highlighted the harsh rules. Bicycle changes were not allowed, nor was outside assistance to fix the inevitable repairs and punctures on the poor roads. When rider Eugene Christophe broke his forks in the Pyrenees he stopped off at a forge, begged a length of metal and started to fix the bike himself. A race official looked - the rider had to do all this work on his own or face penalties. A small boy operating the bellows in the blacksmith's forge cost the rider an extra time delay in addition to the hours he had lost making the repair. World War I's arrival stopped the Tour for four years, and two former winners, Lapize and Francois Faber, were among the young men of Europe to perish in this conflict. Unlike these victims, the race would return after the conflict.